Chapter 5 of Recovering the Reformed Confession is the second part of Recovering a Reformed Identity. Here Clark focuses on the need for Confessions of Faith that we might be in agreement about the meaning of Scripture. The Reformed Church has been busy making Confessions of Faith since the 1500’s. There is no lack of them. Initially there were no exceptions permitted, which makes sense since that contemporary group wrote it. I wouldn’t be taking exceptions to a document I helped create and approved. In the denominations of which I have belonged as a minister exceptions are permitted. We are concerned with the system of doctrine, though any exceptions that depart from the core beliefs would result in exclusion. In other denominations, we have seen how ministers confess to adhering to the Westminster Confession of Faith yet really do not. Those denominations have slid consistently to the left until there are barely recognizable as Christian, much less Reformed. Clark sees the sideline denominations moving in this same direction with the absence of strict subscriptionism. But the problem was not the absence of strict subscriptionism, but the absence of church discipline against those who departed from the core issues of the Confession regarding Scripture, the Trinity, justification and more. System of Doctrine was first advocated by Charles Hodge to avoid the loose Irish view of “substance” and the unforgiving “strict confession” of the Scots & American Presbyterians. Views that contradicted the Reformed faith were not permitted as exceptions. He viewed that strict subscriptionism would lead to the same hypocrisy as substance subscriptionism did. The full or strict subscription view is proposed by such men today as Joseph Pipa, Morton Smith and George W. Knight III. They say that not all doctrines are of equal importance, yet act as if they are. Since the Confession is a summary of Scripture, Pipa argues that if a minister finds that the Confession is out of step with the Scriptures, they should write exegetical papers explaining the difference and advocating the necessary changes. In Pipa’s view, this takes place within the courts of the church, not publicly. In other words, you don’t write a book or teach a class on it. The “good faith” approach was approved by the PCA in 2003. The candidate’s views are examined and they are required to take exceptions in which they differ from any part of the Confession or Catechisms. The Presbytery decides whether or not to grant the exception. Often, the minister may teach the exception as long as he notes it is not the position of the church. 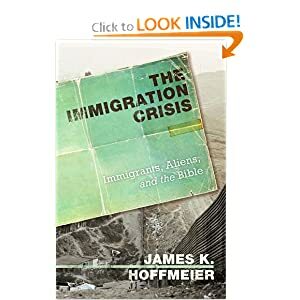 One of the books I picked up at the PCA General Assembly was The Immigration Crisis: Immigrants, Aliens and the Bible by James Hoffmeier, currently a prof of OT and Biblical Archeology at Trinity. His own history is interesting. He grew up in Egypt, the son of missionaries. When Egypt went to war with Israel, their visa was revoked and the left Egypt with only suitcases never to return (he did return as an adult, but they lost nearly all their possessions). They spent 2 weeks in a refugee camp on Cyprus. He has lived in other countries, as a legal immigrant. On the basis of his background, I’m very interested in how he develops the material. He notes the release of Christians on the Border by M. Daniel Carroll just as he was finishing this book. While not a response to Carroll’s book, he does mention a few points of departure in their approach. In terms of the Christian community there are 2 main camps- the Sanctuary camp, and the Law and Order Camp. These are the camps you see in my (altogether too brief) interview on a local news station. The female pastor (?) of a PC (USA) supported the PC (USA) boycott and was offering their church as a sanctuary. She reported anecdotal evidence of racial profiling- which is odd since at the time SB 1070 had yet to become law. It was not being enforced. She didn’t seem able to distinguish between a law and unjust enforcement of the law. What is interesting is that groups like the Sojourners fear the Religious Right. Apparently they aren’t afraid to use the Bible in politics, just not when Conservatives try to use it. Often both sides use the Scriptures improperly. Hoffmeier address hermeneutical issues in the first chapter. He lays out 4 primary approaches to understanding and applying the Scriptures to this (or any) political issue. Looking for the literal correlations between past and present. It is very common among Conservatives, but was also practiced by the “Sanctuary” proponents as well. This view fails to understand the original historical and cultural context, and does not make adequate epochal adjustments. Applying the biblical demand for justice to the current laws. This was used by Martin Luther King Jr.. He rightly called for the laws to be applied fairly to blacks as well as whites. It requires just laws in the first place. That seems to be one of the missing pieces in this puzzle. Examine the legal material to develop the theological or ethical principle there to shape or critique modern laws. Walter Kaiser takes this approach. Establish a biblical worldview as a way to evaluate contemporary social and legal issues. This approach, used by Christopher Wright, takes the theological, social and economic context of Scripture into consideration to “preserve the objective” while changing for the context of any culture or time. This is the approach that the author will use. When discussing this issue with other Christians who differ, it is important to understand how they are using the Bible in making their arguments. This is just as important as their views. As I read the first chapter on how to Recover the Reformed Confession in Scott Clark’s book on the subject, I have a funny feeling. I get the distinct impression he wants us to be a Reformed ghetto. You know, the place where we sit around and discuss all our theological distinctives and pretend that we alone are really Christians. Why do I think this? Well, he again criticizes John Frame for thinking that we are part of Evangelicalism. As a broad-based movement, I think we fit under the tent. We are, after all, evangelical meaning we believe the good news should be made known. We certainly have a more defined theology than most Evangelicals, but if all we do is push our distinctives we fail to see our connection to the rest of the Body of Christ with whom we disagree on some points. Or are we all there is? I’d hate to think we are THAT arrogant. In discussing the reality that our theology is analogical- we only know God as He has revealed Himself to us- Clark sets his sights on Frame again. Frame can defend himself, and has, regarding much of what Clark asserts about his theology. I will agree with Frame that Clark seems to want us to use particular vocabulary that is not itself found in Scripture, nor in our Confessions. One of his complaints about modern Reformed Theology is that we have redefined our theology rather than speaking it so people will understand it. Easy to assert, but difficult to prove. He really doesn’t try. Life here in Arizona has been busy, dodging all the boycotters. In fact, I was nearly interviewed by New4 today regarding the PC (USA) boycott of Arizona. Sadly, something more important came up. I was going to plug the PCA churches in town as I drew the distinction between the 2 denominations. Who knows, maybe another day. And for those of you interested in the words that may haunt me, we also have the Q & A from my candidating weekend. That might actually be helpful for Search Committees. A big thanks to our webmaster and technology guru for making this available. In the 3rd chapter of Recovering the Reformed Confession, R. Scott Clark tackles the Quest for Illegitimate Religious Experience. In this chapter he addresses inroads of mysticism into Reformed practice. It was here that I learned that I am part of the problem. He lays much of the problem at the feet of … Jonathan Edwards. As a result, people like Tim Keller, John Gerstner and R.C. Sproul (under whom I studied the Theology of Edwards’ Sermons in seminary) are unduly influenced by this quest and part of the problem. But first, he mentions Reformed people seeking God’s moral will through listening for the “still small voice.” It seems illegitimate to make a crisis out of a few people who might do this. I’m more familiar (though not supportive) with people “listening” for God’s will in matter upon which Scripture does not speak: this person as a spouse? this job or that one? I would disagree that this is a widespread problem in Reformed Communities. There are no data to substantiate his view of the “crisis”. This troubles me. First, because it unfairly represents the person who asks this question. Second, it neglects one of the ordinary means of grace- personal reading of the Scripture (I also find prayer conspicuously absent from his discussion). He bases his criticism on what “he feels”, subjectivism. From my subjective experience, when I ask someone this question, I mean “what is God teaching you from His Word. When someone asks me this, that is how I answer. As we read God’s Word, the Spirit is at work. Themes emerge from Scripture that we need to pay attention to. This is not private revelation, but the illumination of the Scriptures (which we see in WCF I). He then lets his personal agenda take control regarding the worship service. Since the Scriptures contain 150 Psalms, there should not be a problem with a church that wants to sing to God (I’ve never been anywhere where there was not some introduction, Scripture or liturgical element to break up the songs). Is there something wrong with Power Point in a context in which people don’t read music? Must we cling to the form of hymn books and paper when the point is to actually sing? Where are all these Reformed churches with dramatic presentations? Where is the liturgical dance? Have they happened? Yes, these examples happen. But I find no reason to think that they are now common place among Reformed Churches. While I agree that the quest for an unmediated encounter with God is illegitimate, I’m not convinced how prevalent this is in our community. But that is because of how differently we view revival. He seems to equate revival with revivalism. I have been influenced by Iain Murray’s book Revival and Revivalism ( which Clark criticizes). Murray argues that revivalism is grounded in Pelagianism and the use of illegitimate means for coerce a “decision” and the focus on the subjective experience. Many people, like Murray, use “revival” to describe what Clark terms reformation. Revivalism is a technical term for a movement which has been, and should continue to be, rejected by the Reformed community. But Reformed Communities have witnessed, and affirmed, revivals. Clark’s unfortunate use/change of terminology clouds the issue. But he also takes issue with how a large segment of the Reformed Community, through Jonathan Edwards, has seemingly been bewitched into holding a type of mysticism. In the Introduction, the author notes that 75,000 books on parenting have been written in the last decade. We are apparently obsessed with parenting, and we apparently haven’t discovered how to parent well. In Gospel-Powered Parenting, William Farley brings something different to the table. He isn’t focused on technique, he’s focused on the hearts of the parents and their goals. This is interesting in light of an Atlantic Monthly article a young lady on the plane was reading recently, “Are Fathers Necessary?” Every study (which the article thinks erroneous, without real data) I’ve read indicates they are (check out Life Without Father by David Popenoe. This is why the wise church focuses on dads and tries to involve men in ministry to children (time to man up, guys: you are important to the kingdom!). Success here is essentially defined as children who own the faith of their parents are are involved church members after leaving the home. How they were educated is far less important than their witnessing “experiential religion”, as the Puritans would say, in the home. And especially by dad (hmm, maybe those passages in the Bible aren’t shaped by ‘patriarchism’ but reflect how God often works in light of the covenant). He begins with the assumptions each parent has in that process. They are often unseen, but drive our parenting. He lays out his assumptions. Parenting is not easy. We are sinners, and so are they. There will be plenty of failure to go around. God is sovereign, but He uses means. We are not to be passive, but active, in light of His commands. But we are also to be trusting in light of His promises and providence. A good offense (is better than a good defense). Often we try to protect our kids, fearing the world will corrupt them. As a result, we often raise legalists or rebels. We recognize the battleground is their hearts and make the gospel the main issue to shape their hearts. Love for Christ is the only real way to avoid the corruption of the world. Understand the New Birth. Our kids don’t need the Moralistic Therapeutic Deism of our day. They need to be born again- given spiritual life. This is borne out by its fruit, not merely a decision. God-centered Families. Most people have child-centered families, and sports or performing arts often crowd out manifestations of lively faith. The kids learn they are more important than God, and worship is essentially optional. The second chapter of R. Scott Clark’s book, Recovering the Reformed Confession, begins his more in-depth analysis of the crisis he laid out in the first chapter. Here he tackles The Quest for Illegitimate Religious Certainty. This chapter begins oddly by offering a few examples of this quest in Reformed circles. Those are KJV-only advocates (I’ve missed this movement in the Reformed community), arguing against women in the military (I’m not sure I see the connection here as he explains it), and the Biblical Counseling movement (since he seems to view counseling as a medical issue instead of a sanctification issue in many cases). He just drops those, without anything to back up his claims. There is no smoking gun that these are related to the Illegitimate Quest. Full preterism and denying the free offer of the gospel are about the only ones that I see as connected to this quest. And those 2 are problematic. But he spends the chapter focusing on a literal 6-day creation, theonomy and covenant moralism. His argument is that in the shifting sands of modernity (or would that be post-modernity) some look for a solid place to stand. Their insecurity, he says, leads them to seek certainty in all the wrong places. He sees the role of fundamentalism as important in this. An interesting definition or defining factor. But is he certain they are wrong? He begins with the “rise” of a literal 6-day creation as a boundary marker. In recent years, this was an issue in the PCA as they tried to determine if ministers should subscribe as strictly to this part of the Confession as other parts of the confession, like justification. He notes that the RCUS adopted this as their denominational position in 1999. I have not even heard of the RCUS. The OPC and URC have all studied it as well. They defend this position from Scripture and the Westminster Confession of Faith (4.1). This is what is so interesting to me. He tries to say that the meaning of the Confession is not clear. Since they may have been arguing against Augustine’s instantaneous creation instead of modern science’s evolution, 6 days doesn’t mean 6 days- it might mean something else. This is a doctrinal statement, not a literary genre that may use figurative speech.